I have now integrated my preconceived ideas and the enlightenments engendered by yourself, but I still have trouble differentiating between “the limit of” and “the limits of”. I think George would be better off writing a novel. he could call it “The Limits of Continuity”. I did the sums, no hesitation. But then it asked for explanation. “I understood from first to last!”. Alfred North Whitehead, professor of mathematics and philosophy, and famous for his collaboration with Bertrand Russell on their joint effort, the Principia Mathematica, also wrote a book, “Introduction to Mathematics”, in 1911, for High School students and others who really wanted to know what math was all about. The section on negative numbers is so relevant to the teaching of that topic today that it is a MUST READ. Click the link to download this section. It really is the limit. Please don’t take me there. The funny thing about the calculus is that it was brought into existence by Isaac Newton in 1666 or earlier, and was developed and used without the idea of limits for over 150 years. The first attempt to get rid of the troublesome infinitesimals was by Cauchy in 1821, where he introduced the chord slope (f(x + h) – f(x))/h. The whole business of finding a satisfactory definition of the derivative was finally achieved by Weierstrass in the mid 19th century. So here we go with cubics, and the same approach can be used for any whole number power of x, even negative ones. You should try it. Next time sin(x) and cos(x), so no more sin(h)/h stuff. So it seemed to me that calculus without limits would be a good idea. 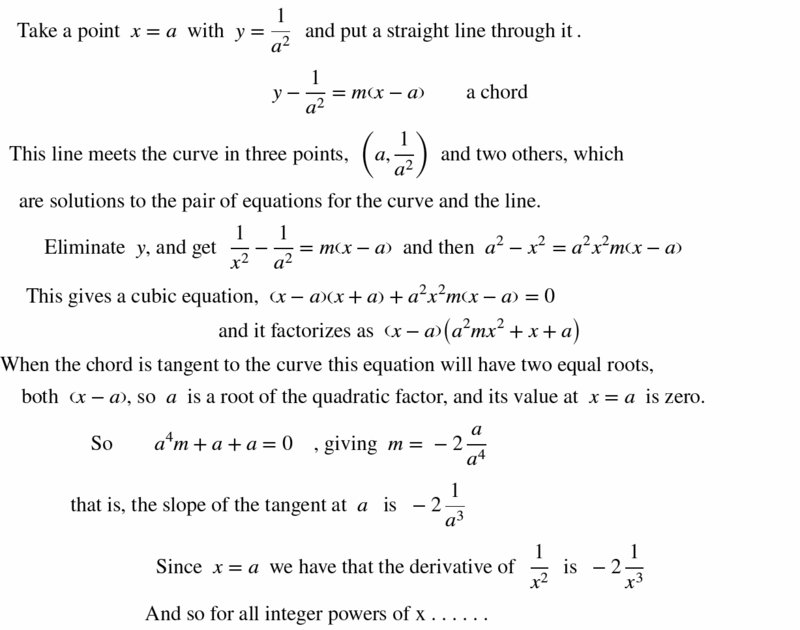 Not just for powers of x, but also for trig, exp and log functions. This is the first of several posts on this subject. Is somewhere I don’t want to be. To that one, in the endless void? I tried translation and rotation. Then I had a crazy notion. I would pass a rigid motion. Result – a lovely hemorrhoid. Said “Here’s six candies for your break. “Give your sister half of them”. Now Johnny’s brain is on the make. He gives her one, and then another. Little sister stamps her feet! “And the last one!” says his mother. “Damn” thinks Johnny, “I can’t cheat!”. “Johnny, what is half of six?”. “Now break the row right in the middle. “Just split the half and count the bricks”. “So now you see, three’s half of six”. What is an equation? . . . . .What is NOT an equation? Before starting, a definition: Any combination of numbers and letters and arithmetical operations (including = < > <= >=) with more than three symbols is an algebra “thing”. 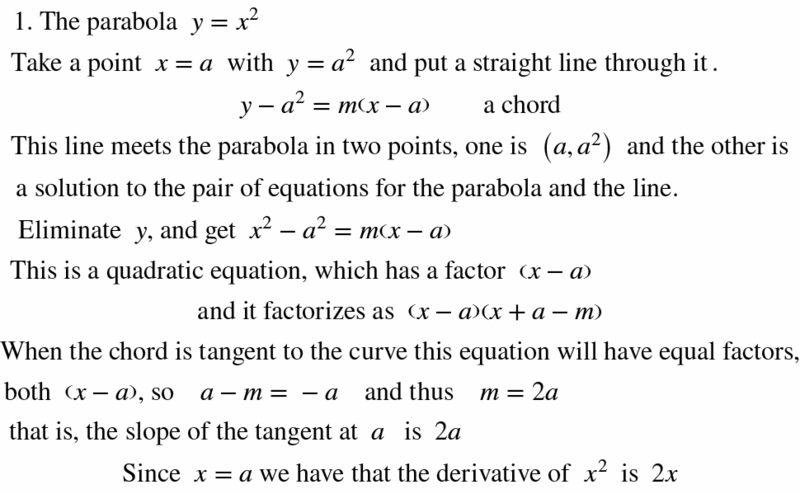 So, in passing, observe that a “number sentence” is an algebra “thing”. The values of x and y are such that the square of the x value added to the square of the y value is equal to 4. This and the one above specify pairs of values. Then we have identities, sometimes called equivalence statements. or “The value of the output of the function f for input x is the value of 3x + 2”. 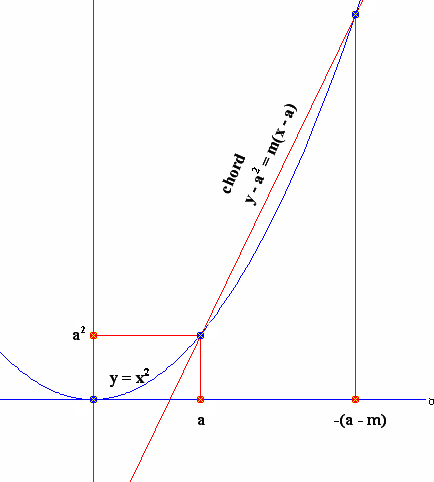 This means “The value of the output of the function f for input x is to be given the name y”. 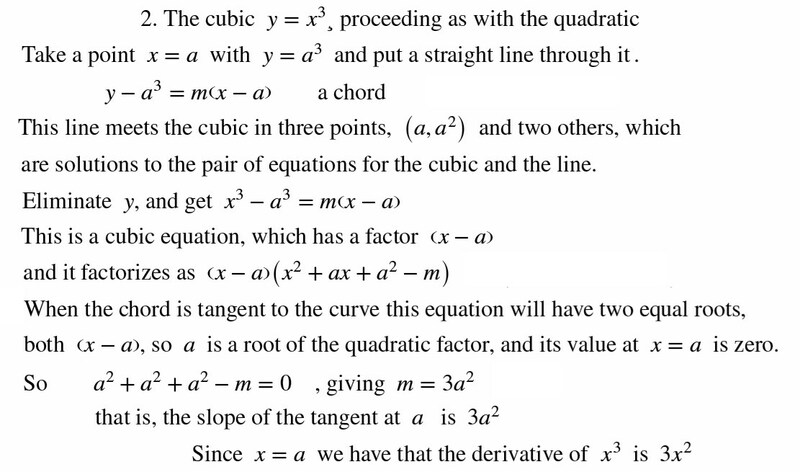 These are NOT equations and they are NOT identities. 3 + 5 is 8 and 4 x 6 is 24 would be better.